The Alfa Giulia and Stelvio will always offer as much choice to the customer, whether in finishes or engines. Here, the special series Nring, who oversees the range. Alfa Romeo takes advantage of the transition to the new standards Euro-6d-Temp to review the ranges of its Giulia and Stelvio. New finishes make their appearance, while some engines gain power. If, for some brands, the changeover to the Euro standards 6d-Temp is a synonym of narrowing (often momentary) of the range due to the delays of probate, such is not the case with Alfa Romeo. On the contrary, the sedan, the Giulia and the SUV Stelvio retain a choice always as wide in terms of drive and gain even new finishes. Regarding the engines, we note that the diesels have all of a system, the SRC (selective catalytic reduction) with the addition of AdBlue, while the versions with 150 and 180 hp of the block 2.2 gain 10 hp extra to reach 160 and 190 hp. In addition, on the Giulia, the small version 136 hp now available with the eight-speed automatic transmission. In essence, the four-cylinder 2.0 turbo (200 and 280 hp) is seen with a particle filter, while the V6 2.9 twin turbo 510 hp variants Quadrifoglio now has a system of dual injection (direct and indirect). The choice of finishes extends, on either the Giulia or the Stelvio, which both have nine levels with the Business reserved for professionals and special series Nring. Thus, a new finish Executive made his entrance, wanting more elegant, however, being placed under the Lusso. In addition, the Stelvio is now located on level Turismo, which is equivalent to the Veloce as we know it on the Giulia. The equipment is enriched, with, in particular, the system Apple Carplay/Android Auto, now standard on all finishes outside of the versions of entry – “Giulia” and ” Stelvio “. The sunroof is also provided in series on the finishes Lusso and Veloce/Turismo. 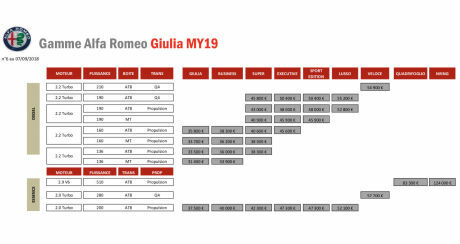 The rates of Giulia and Stelvio showed a slight increase, with a starting price of 31 € 400 and the Giulia is equipped with the 2.2 diesel 136 hp. The Stelvio is claiming from his side at least 39 900 € with the 2.2 diesel of 160 hp. Naturally, the levels of CO2 and therefore the malus green are on the rise with the transition to the registration WLTP. Thus, while on the Giulia diesels in propulsion were previously exempt from the penalty, today they are taxed between 210 and 473 €. Most notable, the version Veloce petrol sedan, equipped with a block of 280 hp and awd, is now penalised to the tune of 7613 € (175 g/km) instead of 2010 € (148 g/km) previously. Audi PB18 e-tron : a supercar Audi 100% power of 775 hp !